New Schumacher Racing Releases « Big Squid RC – RC Car and Truck News, Reviews, Videos, and More! 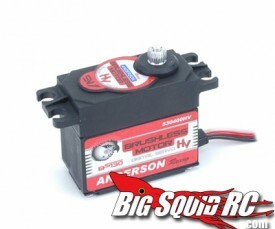 Schumacher gave word of two new Anderson High Voltage Brushless servos today. The AN530400HV – Metal gears, brushless, and a lightning fast speed of just 0.06 seconds @ 7.4v for 60 degrees of rotation and 194oz or torque means that this servo is ideal for 1/10 sized cars whereas the AN530400HV is more suited to larger applications. You get a massive 305oz of torque at a 0.08 sec speed for 60 degrees of rotation @ 7.4v. 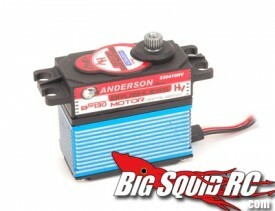 Both servos are priced very competitively, so expect good rivals for Hitec and Savox servos! 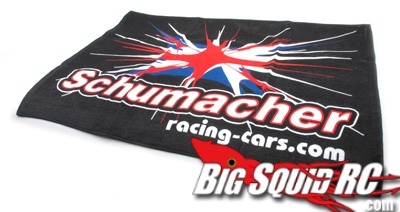 Schumacher also released an awesome looking 3ft x 2ft Pit Towel, printed with the Schumacher logo. Check out the Schumacher website for details!